Our 104th anniversary Almond Festival is coming up soon! The Capay Valley Almond Festival began in 1915 and has long been a Northern California tradition. 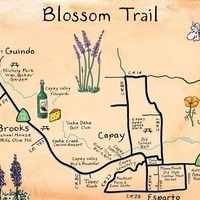 The only six town event in Northern California, the festival is a showcase of the Esparto/Capay Valley Region. The communities of Madison, Esparto, Capay, Brooks, Guinda, and Rumsey all have something exciting and fun to offer the whole family the whole day long! Entertainment, crafts, good food and fun for all members of the family are yours to enjoy. It is a wonderful time to see the beauty of the whole Capay Valley and to meet many of the wonderful people who live and work in the area.